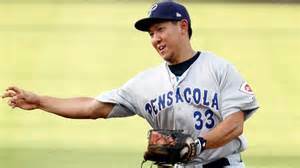 Ray Chang played all nine positions in Monday night’s season finale with Pensacola. On Monday night the Double-A Pensacola Blue Wahoos finished their regular season schedule with a match-up against the Mobile BayBears but that wasn’t the only highlight of the night as Pensacola was defeated 4-2. The 32 year old also went 3 for 4 on the night with a run scored with a box score that looked like the following: 1B-2B-SS-3B-LF-CF-RF-C-P.
Mark Hessman of the Detroit Tigers’ Triple-A Toledo Mud Hens also accomplished this task in 2009 as well as Justin Toole who did in 2012 with the Atlanta Braves’ Class-A Advanced Mudcats and the Brewers’ Nathan Orf who just did it in 2014 with the High-A Brevard County Manatees. Chang went to Rockhurst University and was then signed by the San Diego Padres in July 2005 and has also played in the Pittsburgh Pirates, Boston Red Sox and Minnesota Twins organizations before signing with the Cincinnati Reds in January 2013.